Our patients are full of questions, and we provide the answers. On our FAQ page, our Las Vegas foot doctors explore the most common questions about heel pain, bunions, nail fungus, ingrown toenails, neuropathy, surgery, and more. Browse or search through our FAQ to get the answers you need. How can I treat heel pain at home? When heel pain first emerges, you can often treat it effectively right from the comfort of your own home. 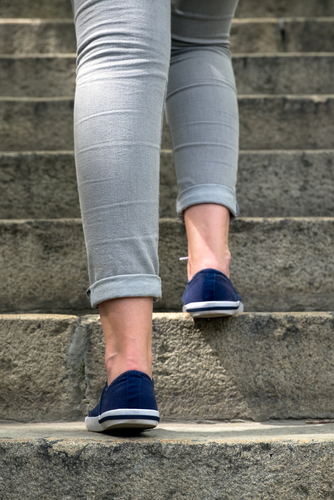 If it’s a simple flare up of discomfort caused by stress or repetitive activity—for example, a long day of standing or working on your feet, or from starting up a new sport or running route—often a few days of rest is more than enough to get your feet back in top shape. Stretching your feet and calves, using ice or non-prescription painkillers, and making sure your shoes fit well and offer sufficient cushioning and arch support are also recommended. When pain continues to persist for several days or longer, you should take the next step and give Absolute Foot Care Specialists in Las Vegas a call. We specialize in determining the root cause of your pain and developing a personalized treatment plan to meet your needs quickly and effectively. To schedule with us, please dial (702) 839-2010. What should I do about an ingrown toenail? An ingrown toenail is one of those conditions that will only get worse if you try to ignore it, so if you notice the problem, seek help for it immediately. Conservative care is an option in the early stages of the condition. Soaking the toe in warm water can help relieve pain. Sliding clean cotton or floss under the ingrowing corner can help lift the edge of it above your skin, so it doesn’t grow into your toe. Changing your shoes can reduce pressure on your digit that might be influencing your nail to curve. However, if the nail has already grown in quite a bit, conservative methods may not be an effective option. You may need an ingrown nail removal to eliminate the troublesome edge entirely. Our team at Absolute Foot Care Specialists are experts with this and will be able to quickly and carefully eliminate the ingrown edge, immediately improving your pain. Don’t wait until you can barely walk to get good nail care. Instead contact Absolute Foot Care Specialists in Las Vegas for an appointment today by calling (702) 839-2010. What are the best ways to avoid running injuries? Avoiding common running injuries can be as simple as taking care of your feet and preventing overuse. Building strength, conditioning your body, wearing the right shoes, and adjusting for your biomechanics are all important steps to keeping your lower limbs safe when you run. Strong muscles, bones, and connective tissues are less prone to injuries. Build up strength with exercises and cross-training. Condition your feet to handle hard impacts and improve your time and distance by beginning slow and increasing the challenge over time. Make sure you wear footwear that’s appropriate for your foot shape, running style, and biomechanical needs. If you know you’re prone to overpronation or other issues that could contribute to an injury, you might need special orthotics when you run as well. 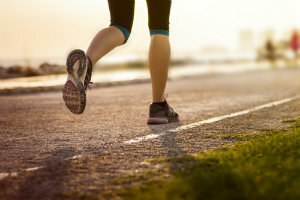 Avoiding running injuries really involves taking care of your feet while they are healthy and investigating anything that might be a problem early on. If you’re concerned about your lower limb health when you run, let our team at Absolute Foot Care Specialists help you before a problem strikes. Contact our Las Vegas offices today for more information. You can call (702) 839-2010 or use our website to reach us. Depending on how much and how hard you run, your running shoes can wear out and need to be replaced fairly quickly. Pounding the ground and logging lots of miles wears down a shoe, eliminating your tread and breaking down the supporting structures on the inside. After running between 300-600 miles on a single pair of shoes, it’s usually time to replace them. Exactly when that is will depend on you, your routines, and your unique feet. Running on rough surfaces, striking the ground hard, and possessing certain biomechanics may wear out a pair of shoes more quickly than others. How your shoes feel when you run is another indicator that you might need to replace them. When shoes wear out, they can’t support you properly, so your feet fatigue more easily. You may notice your lower limbs feeling sore and uncomfortable, or even the start of shin pain and other issues. 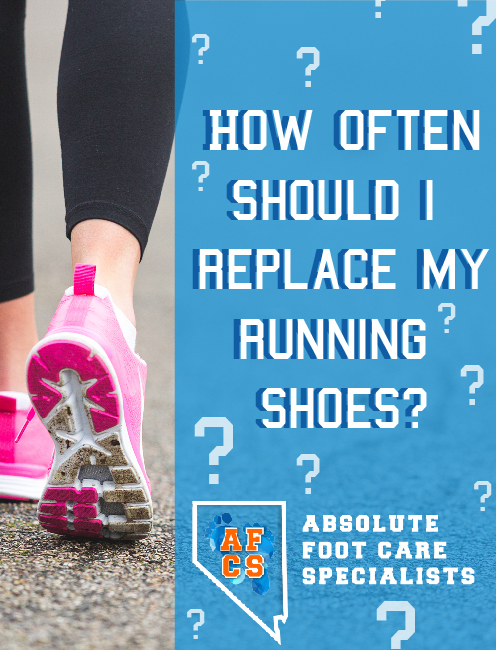 If you’re struggling with foot pain or need help replacing your running shoes, let us now at Absolute Foot Care Specialists so we can help. Make an appointment online or by calling our Las Vegas offices at (702) 839-2010. What are the causes of flat feet in adulthood? Developing flat feet in adulthood is a sign of problems in the tendons that support your midfoot. You have tendons—one in particular, the posterior tibial tendon—that help hold up your arch. Years of wear and tear, or even a sudden injury, can weaken and damage tendon tissue so it’s not able to do its job well. Your arch slowly collapses down and in without its full support. As a result, you develop adult flatfoot. This may or may not be a painful problem for you. As your arch collapses, your foot may struggle to absorb weight and shock properly, which can lead to soreness and discomfort. On top of that, you may feel pain around the inside of your ankle from the damaged tendon. Typically the pain feels worst when you’re active. The good news is that there are ways to treat your flatfoot problems. Let Absolute Foot Care Specialists take care of your discomfort. Contact our Las Vegas offices today by calling (702) 839-2010 or by using our online contact forms. What increases your risk for tendon problems? Several factors make it more likely you’ll develop painful tendon problems in your lower limbs. These risk factors include your age and your activities. The older you get, the more you’re prone to tendon pain and injuries. This is because these connectors become less flexible over time, so they aren’t able to stretch as far or as much as when you are young. Working or participating in an activity with a lot of repetitive motions is another major risk. Frequent, repetitive motions, holding awkward positions, and forcefully exerting yourself can strain and damage tendons over time. Tasks at work, chores at home, and sports are the biggest culprits for this. Incorrect posture or poor conditioning for your activities add additional risks for your connectors. If you know you’re at risk for tendon problems, the best thing you can do is take preventative steps to help protect your lower limbs. Our team at Absolute Foot Care Specialists can help you with this. Contact our Las Vegas offices for more information, or an appointment to take care of your tendons now. You can use our website or call (702) 839-2010 to reach us. How long does it take a broken toe to heal? Broken toes need time to heal, just like any other fracture. Exactly how long it takes depends partly on how severe the break was. Simple, well-aligned toe fractures may only take a few weeks to heal, while more serious ones that have to be manipulated back into place—or even fixed with surgery—can take much longer to recover. In general, expect roughly 4-8 weeks for your toe to be completely restored. Complications could potentially make the healing much longer, though, so if you’re ever concerned you might have broken a digit, don’t wait to get it checked and treated and risk additional problems. A specialist like Dr. Noah Levine will evaluate your toe and use diagnostic images to determine if it really is broken. This also allows our team to see how serious your condition is and determine the best course of treatment. Minor toe fractures may be able to be buddy-taped, while more serious ones might require a special boot to protect them. 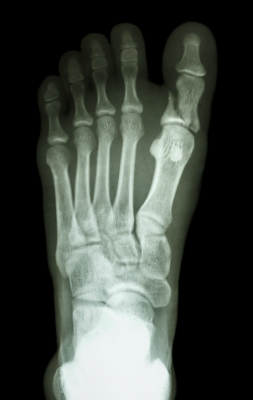 Contact Absolute Foot Care Specialists today for more information about broken toes. You can reach us online or by calling our Las Vegas offices at (702) 839-2010.